Do futons make good beds? A futon is a Japanese traditional style bedding. The Japanese word for a traditional bed is futon. It has the “shikibuton” means the mattress, the “kakebuton” is the comforter and the “makura” means the pillow. Futon in Japan is a thin mattress laid on the floor instead of a traditional bed, it can be folded, and stored in a large closet. The Americans consider futon as a sofa that doubles as a guest bed. It is thicker than the Japanese one and can consist of springs, cotton, foam, or a combination of all. You can place a futon on a foundation, directly on the floor, or onto a frame as you want. If you need a floor mattress, check here. A futon is considered as a flexible, supportive, bouncy yet firm mattress which provides a balanced seating and sleeping experience. The first reason why you should a futon is its storage. A futon does not take much space in your room. It just occupies a little space and can be easily stored away. It takes less effort to convert from one mode to another. This alone makes the futon an attractive choice for those with limited square footage. Another benefit of a futon mattress is that you can get a high-quality product with an acceptable or sometimes low price. But it is often more than several hundred dollars, depending on the size of the futon mattress you want to buy. What is the best type of futon mattress to buy? Usually, a futon consists of 3 basic parts: the frame, mattress, and cover. The frames have a wide range of types but here are 3 major types of futon frames: bifold, loveseat, and trifold. This is one of the most common type of futon frame in which the futon mattress is folded in half the long way. It is also available in full, queen, and smaller chair sizes. It is looks like an equivalent sofa designed for a small space. These use a 2-piece futon mattress to fit a twin or full size bed to for saving the space as much as possible. A loveseat futon frame is perfect for efficient space usage in guest rooms, home offices, or any limited-size rooms. Tri-fold futon frame is another great choice for small spaces. Because the mattress is folded this way, only thinner models can be used on trifold futon frames. 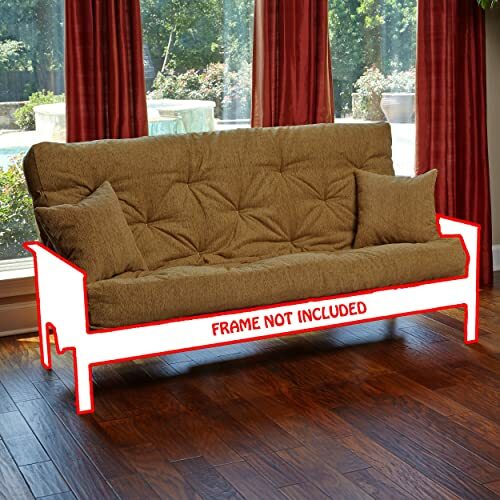 This type of frame is quite more difficult to convert from couch to bed than bi-fold or loveseat futon frames. In addition, futon frames are typically constructed from one of two materials, wood or metal. So the question is how you can choose the best futon mattress? There are different things to consider, besides different colors and sizes. You have to decide the thickness of the mattress. Thin, sleek futon frames look better with thinner mattresses, while substantial wooden pieces need thicker mattresses to match their frames. Then you should consider the cover of the futon mattress. This is your opportunity to pick your color and fabric preference. Some mattresses already have a water-resistant covering, but many do not. This will affect the cost of your mattress. Another important step is that do not forget to consider the size of the futon frame, as well. 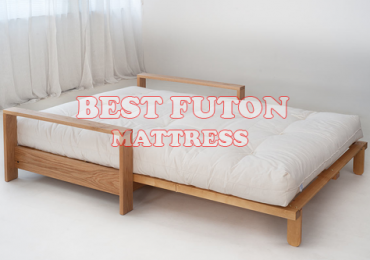 So now below is some information about best products of futon mattress briefly. Please take a look at it to consider product best satisfies your needs. This will help determine the best choice for you. If you need floor mattress for sleeping, read more here. The Better Homes and Gardens Wood Arm Futon with Coil Mattress is the best choice for any modern living space. This type of futon mattress is really comfortable, convenient. You can use it as a sofa during the day and convert it into a full-size sleeper in the night effortlessly. Featuring a contemporary design and rich wood finish, this futon mattress bed has solid wooden arms and sturdy metal frame for durability. 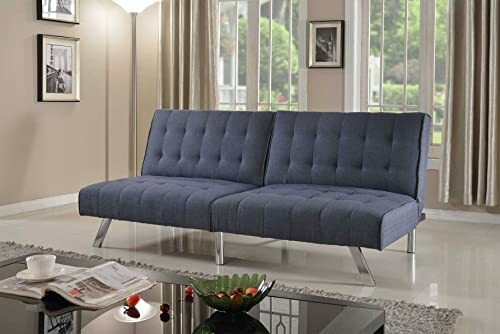 The solid metal frame of this futon is very important because when you want to convert it into a sleeper, the futon would be able to hold up your weight easily without any shaky and squeaky noises. This futon mattress has the 8 inch mattress comes with 522 independently encased coils and quality foam. It could help to reduce the friction and allow the sleeper to rest easy throughout the night. Moreover, these individually encased coils make sure that the right amount of pressure is being put on in the right places. So you can expect complete support whether you are sitting or lying down on this Better Homes and Gardens futon. Or if you want to share the space with your sister, for example, these coils could help isolate motion and reduce vibrations so your sister could also enjoy her sleep easily. It has a modern and brilliant design against any background and is very easy to assemble as well. The 8 inch mattress consists of individually encased coils that isolate motion and reduce vibrations, especially when you have another person sleeping next to you. The futon mattress comes with a soft twill cover. It might be too low for some individuals. It might require time to expand. So briefly, stylish, very functional, and with the price just over 300 dollars a little bit, the Better Homes and Gardens Wood Arm Futon with Coil Mattress will prove to be a wonderful addition to your home furnishing. All your expectations about what a futon can be go out the window with the DHP Allegra Pillow-Top Futon, a futon designed for your comfort. It looks regal and beautiful against any background due to its black microfiber upholstery. This futon does have a quilted pillow top for amazing comfort for both sofa and bed mode. The DHP Allegra Pillow-Top Futon, Black futon mattress is a cinch to convert this futon from bed to sofa and back again. You can convert it easily to lounging or sleeping position without any assembly tools or workmen to help you. Invitingly plush, the DHP Allegra Futon’s cushioning is a welcoming sight. 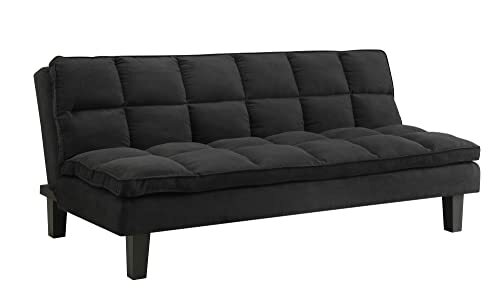 The futon is upholstered in black microfiber so you do not need to spend a lot of money on its dry cleaning. The manufacturers already helped you to solve this problem easily with the black microfiber upholstery. The only thing you need is just a damp cloth to wipe clean the futon cloth without ruining its overall look. The multi-position back quickly and simply converts this futon from lounger to sleeper. The DHP Allegra futon is definitely versatile and practical fitting for any front room or place of work space. In addition, its pillow top sensible cushions is designed for extra comfort of the futon. Another great feature of the DHP Allegra Pillow-Top Futon, Black is the foam padded seats that are really durable. Multi-position recliner for the perfect lounging angle. Pillow top combines comfort with clean style. Wood frame with tapered legs. Great option for rooms with limited space. This futon mattress is not a good choice for tall individuals. Not as comfortable as a bet because of the less softness. In conclusion, the DHP Allegra Pillow-Top Futon, Black is definitely a budge friendly, versatile and very modern piece of furniture that looks beautiful against any background. If you are looking for an extra bed for overnight guests, it would always be a great choice for you with a low price, approximately 250 dollars. The Home Life Linen with Split Back Adjustable Klik Klak Sofa Futon Bed is designed with an adjustable back. So it just takes you a few seconds to convert into a bed, or even a lounger. This also allows the users to adjust the futon into various positions, not just only two. Another great point about this futon mattress is that it comes with an appearance more like a sofa than a bed. So it could look good even if you want set it in your living room to go with the rest of the furniture. The Home Life Linen with Split Back Adjustable Klik Klak Sofa Futon Bed is upholstered in a modern and snug microfiber. This Futon Bed comes with wooden legs that could bring an elegant look against any backgrounds to the futon. It is also designed with a frame and mattress attached. The Klik Klak allows users to adjust the back of the futon to many different positions. Easy and fast to assemble. Some people might find the mattress quite firm. May create a space in the midsection lengthwise. 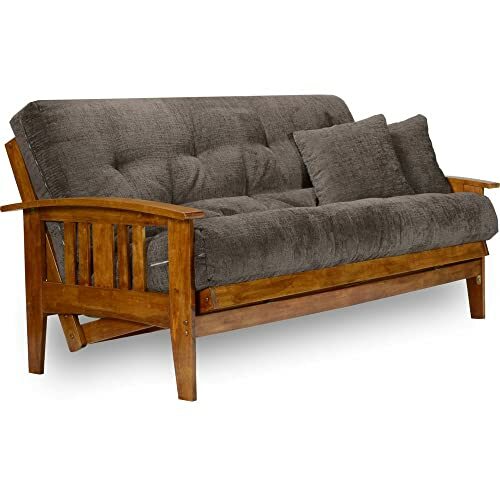 This item comes with the Savannah Sofa Bed solid hardwood frame only but it is still a great choice to buy. Moreover, if you want to change the appearance of your futon, just go ahead and do it because the hardwood responds exceptionally well to stains and paints. The Full Size Savannah Futon Sofa Bed is designed with a polar hardwood frame which is smooth, clean and unfinished. The wood has been kiln dried and planed on 4 sides to be smooth to the touch. The wood takes stain or paint exceptionally well but most of customers just leave it as is and enjoy the beauty of natural wood. This unique design of the Full Size Savannah Futon Sofa Bed allows the sofa to be easily adjusted from fully upright to a comfortably reclining sofa position and finally ending on a sleeper position. When you are ready for bed, nothing could be easier, simply lift the front edge and slide back. This sofa bed goes from upright to recline to bed in seconds. Stains and paints easily or leave unfinished. 100% Solid kiln dried hardwood frame. Quickly converts from upright to reclining to bed. No mattress or cover included. There have been some complaints regarding some of the boards having a slight greenish hue. The natural wood feel not only looks regal but also divine making the Full Size Savannah Futon Sofa Bed beautiful. 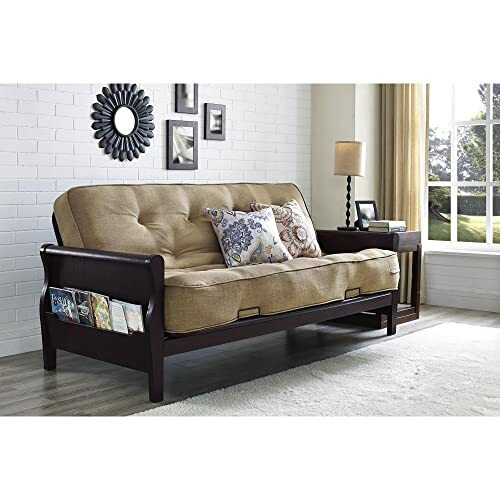 With nearly 400 dollars you can buy the Full Size Savannah Futon Sofa Bed for your home. The DHP Emily Convertible Linen Futon is made to offer both functionality and style. It looks really sleek and stylish with its rounded edges, tufting and chrome legs. This futon mattress could be converted from a sofa to bed easily within a minute from sitting, to lounging to sleeping positions and features a split back for added versatility. Furthermore, this futon is sturdy and strong with a metallic frame. It consists of a well-padded mattress making the futon comfortable for sleeping or sitting for long hours. The versatility, modern appeal and sleek design of the Emily Split Back Futon make it perfect for any home or office space. Upholstered in eye catching navy linen the futon has a different feel from its faux-leather counterpart. The cushions are full and stay firm even after daily use, and the polyester and foam filling provides ample comfort. DHP’s Emily Convertible Futon has a modern look that is fitting for most rooms. In addition, the futon could last for a long time due to its linen fabric that is built in a very compact manner. So dust could not seep in and destroy the cushions of the futon. Click-clack technology extends its durability. Steel back and legs of the sofa appear glassy that draws in the people. This futon is a little bit heavy. Seems slight hard to sit on for a long time. With the price of nearly 280 dollars, this DHP Emily Convertible Linen Futon is definitely is great choice that you should not miss for decorating your room. The Memory Foam Futon Mattress Beige Upholstery Fabric with 2 Matching Pillows features a cotton wrapped foam construction. The futon consists of four layers of a premium blend of cotton and polyester, two layers of Memory Foam and another layer which is made of polyurethane foam. This combination makes for a very comfortable mattress while also keeping it sufficiently firm to sleep well on it. These layers make sure that the user would not feel like their sitting, lounging or lying on a futon mattress. The Memory Foam Futon Mattress Beige Upholstery Fabric with 2 Matching Pillows comes with two options: full and queen. These are both using Cancun Maple for color. Each variant features the innovative cotton wrapped foam construction and a complimentary cotton cover fitting for any styles. 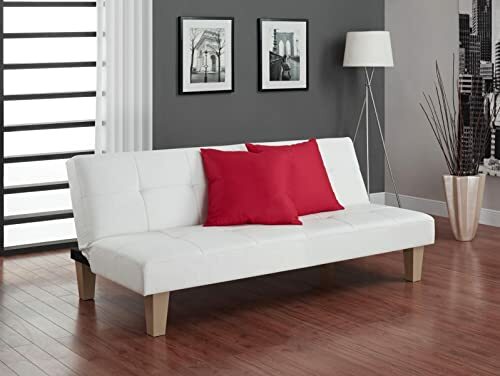 Therefore the cotton cover of this futon is very durable and lightweight and does not hold in any moisture which would otherwise attract mold and dust mites. Amazing layering which compliment a bed mattress. The futon mattress is a full Queen size which means when the futon is converted into a sleeper; it resembles and feels like a real bed. The memory foam layering adjusts to the sleeper’s weight and takes off the extra pressure from the pressure points. Sometimes the mattress might be too snug. Finally, it is safe to say that this is an excellent investment. For the price of less than 250 dollars, you are getting a lot of advantages such as a great mattress, quality upholstery, overall a satisfying piece of furniture that can fit into most homes with ease. Compared to many other regular futons found in the market, the DHP Black Metal Arm with 6″ Futon Mattress features a very contemporary and versatile design with sturdy black metal frame and 6” mattress futon. The frame is not really heavy so it is really easy to relocate the futon or convert quickly from sofa to full size sleeper. Two middle legs are designed for added support and stability for this chic looking futon. The manufacturers want to make sure that there is no point of the futon feels wobbly or the user is concerned about it caving in. To deal with any weight, two extra central legs were added to the frame of the DHP Black Metal Arm with 6″ Futon Mattress. The DHP Black Metal Arm with 6″ Futon Mattress, Red comes with a black arm futon making the user more comfortable. When you are looking for a futon, one of the most important things to consider is its size. 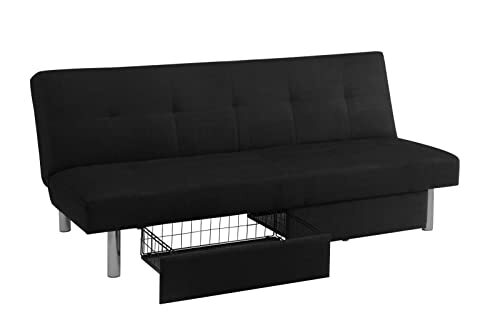 This futon is made of black metal in a modern design which is very simple and very stylists ideal small space to accommodate more visitors while they are just visiting for a day or sleeping over. Two mattress retainer clips to hold the mattress in place. Two central legs add extra support to the overall futon. Comes with a fully adjusted and properly sitting mattress. Some users complained that it is confusing when setting the futon. 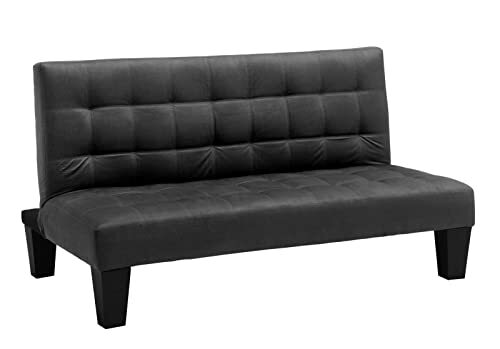 With a really low price (nearly 150 dollars) for a beautiful and modern design, DHP Black Metal Arm with 6″ Futon Mattress could be listed as the best futon sofa for you if you just have a limited budget. Stylish yet practical, the DHP Sola 2037019 Microfiber Storage Futon, Black is perfect for your living area. With a sleek design and striking black shade, the elegant futon blends with your modern décor. The design of the DHP Sola Convertible Sofa Futon is very chic but at the same time very resourceful as well. Users can use the storage space compartments of this top rated futon sleeper sofa to store multiple things such as video controllers and even bed linen! This pull-out storage compartments of the super comfy futon also provides convenient space for storing books, blankets or pillows. 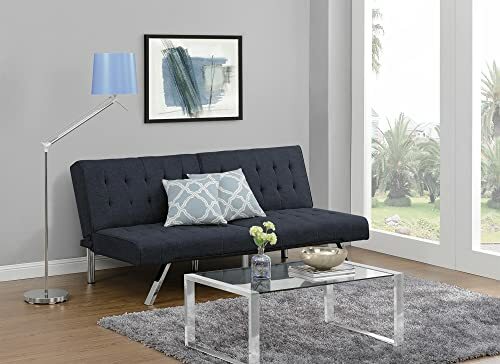 In addition, the DHP Sola Convertible Sofa Futon is upholstered in soft microfiber for added comfort and has a sturdy wooden frame and metal legs for durability and support. The DHP Sola Convertible Sofa Futon comes with three adjustable positions. It means that you can use this best rated futon bed and convert it into converts into three different pieces for three different purposes. The only thing you need to do is that adjusting the futon bed when you want either to sit on it like a sofa, lay back as on a lounger or even falling back into a comfortable sleeper. Can bear up to 600 pounds weight. Can be converted into three comfortable positions. Comes with a storage compartment to hold any supporting bed linens for your futon. The drawers sometimes are not sliding in and out smoothly. The mattress layering might be quite light for some individuals. Bring the perfection for your dorms or apartments with this comfortable futon mattress. Why not while you can buy one of the best quality futons with just from 220 dollars for the price. This cheap comfortable junior futon bed has a perfect size for your kids to study, play video games, or even listen to music. The DHP Ariana Junior Futon is listed as the most comfortable futon and the greatest addition to any child’s room. The DHP Ariana Junior Microfiber Sofa Futon Couch features polyester microfiber upholstery which is not only soft and smooth but can be easily wiped clean. This could help parents prevent any accidents and messes when kids play on the futon bed. In addition, with its microfiber upholstery, this junior futon is simple and casual, complementing any room décor. 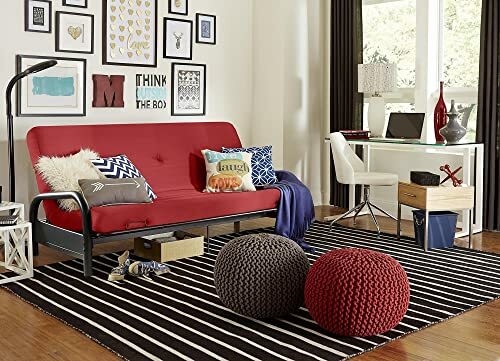 You can quickly and easily convert this junior futon by using the multi-position back features Click-Clack technology from sitting to lounging to sleep position. Its low seat height makes it ideal for kids and tweens. Although the futon is built for small and compact spaces, like the kids room, it still sits well in various places in your house. Low seating height is great for kids as it allows them to get on and off it easily. The Click Clack system ensures that the futon can be converted into multiple different positions easily. Easy to clean polyester microfiber upholstery. Sits low is perfect for children and teens. The legs might break if kids use the futon bed for jumping on it. Built to accommodate children due to its small size. So if you are thinking about buying a junior cheap comfortable futon mattress for your kids, the DHP Ariana Junior Microfiber Sofa Futon Couch is the most suitable futon bed for you with just only approximately 100 dollars. The DHP’s Aria Futon Sofa Bed comes with a sturdy, durable and chic appearance. It is rated as one of the cheapest futon bed in the market and is a perfect choice for those who are looking for a small futon to fit in tight spaces. With its sleek, chic and modern appearance, the Aria Futon fits perfectly with most room decors. The DHP’s Aria Futon Sofa Bed has a tufted, white faux leather upholstery with detail stitching. In addition, it would not fade nor do stain or peel like real leather. Its faux leather look is the most important factor making this futon look contemporary, extravagant and fit to be placed in any places in your house. Users can convert the futon into various positions. All the required tools are equipped with the packaging. Compact wooden frame can fit into a lot of different spaces. Might be a little low for some users. This futon is not a full sized futon mattress so it does not convert into a full sized sleeper either accommodate adult size sleepers. With its sleek, modern appearance, the DHP Aria Futon provides style versatility, and converts to multiple positions to suit your preferences. Moreover, the price of this high quality futon bed is in the range of just 200 dollars making it one of the best futon to buy. Futon mattresses are always comfortable since they are made of high-quality materials. They are adjustable making every purchase comfortable and able to use it for different occasions. They also give an ample time when cleaning them. From these above branches of futon beds, I hope that you could now decide which type is the most comfortable, the most suitable for your needs and also your budget.